We call this a “Blocks of the Month” quilt as you will be making 4 blocks each month. That way you will have a new quilt for your bed in half the time! 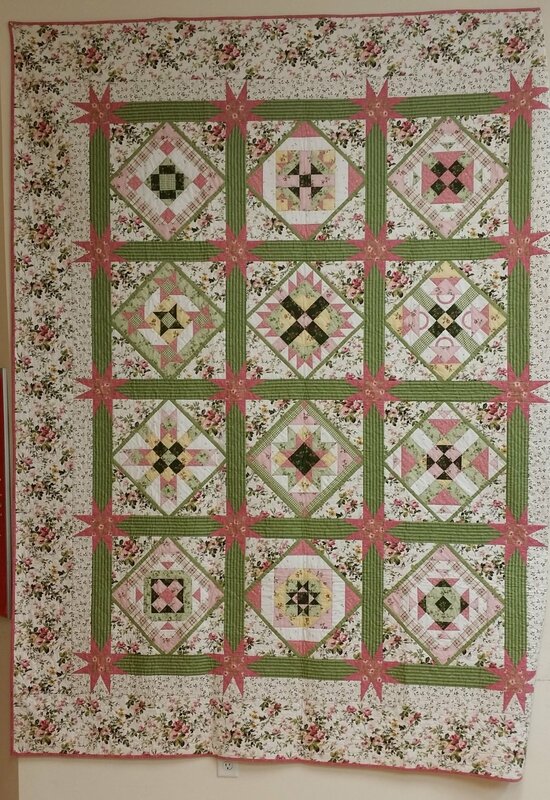 This 12 block sampler quilt measures approximately 85 x 105 and uses Marti Michell’s template set L. It is a perfect quilt for beginners and experienced quilters alike. Class will include a one-hour lecture/demonstration featuring cutting and piecing tips. If you have not rotary cut using these templates before you will be amazed not only at the accurate cutting but also at your accurate piecing. We will ask you to choose a theme fabric – select a beautiful multi-colored fabric. The first class will cover additional fabric selection as well as the cutting and piecing of your first four blocks.